DCA091 is impressionist landscape painting, presenting Railway in nature, heading toward North, toward horizon. Symbolically, one can say that painting DCA091 presents course of ones life and fact that we are inevitably approaching new stages and events in life, just over the horizon. Painting possesses intricate depth and layers thanks to smart and inspired brush strokes and color application over the painting, in the process of landscape creation. On DCA091 painter has presented rich and peaceful tones of fall sunset. Painting is lush in shades of fall gold, contrasted with cobalt shades of sky in dusk. Landscape on the DCA091 painting is peaceful and Calm, enabling observer to engage in introspective thinking while looking at it. 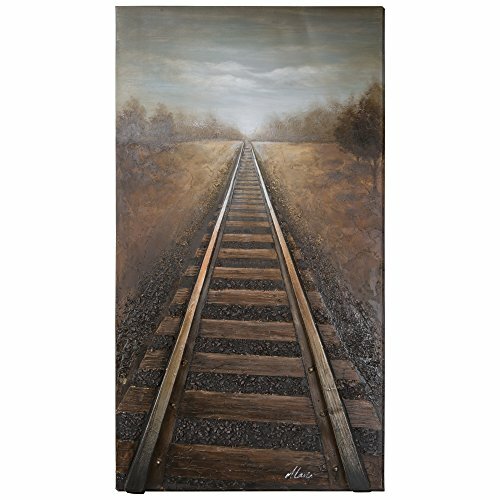 When you look at this serene landscape and railroad that leads to eternity, it will seem inevitable to engage into some in-depth observation or retrospective contemplation. Painting is very realistically presenting all the details in landscape, grabbing observers attention with focused exposition of individual items such as pebbles between railroad tracks, shade cast toward railroad from nearby Golden trees that seem like they are trembling on easy sunset breeze. Shades of sunset are in particularly dazzling way presented on the sky that is not just darkening blue, but there are also golden-orange hues of sun sliding behind the horizon that embraces both the sun and railroad. This work of art is hand painted on a gallery wrapped canvas and signed by the artist ensuring each piece has some subtle differences making it distinctly unique to each owner. The high quality canvas wraps tightly around a sturdy wooden frame that will last for years to come. The painting comes with either a pre-strewn wire or hinges on the back so that its ready for immediate wall mounting. The light weight of the piece allows for easy hanging without worry of damaging your wall. The acrylic paint creates a rich texture that will really catch the light, creating a very sophisticated allure. Each painting is carefully packaged and inspected prior to shipping, ensuring every piece Arrives safely and ready to hang on your wall, making for a pleasant purchasing experience from beginning to end.